Just Gotta Share This: It Looks Like a Baby Dragon! I just saw this picture on Facebook. 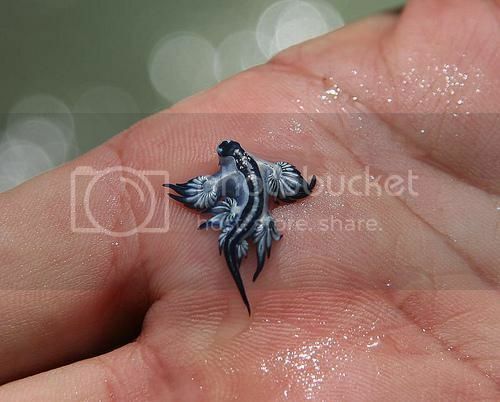 The description says that it's a Glaucus Atlanticus sea slug, but it looks like a baby dragon - or some kind of fake. Doesn't it? 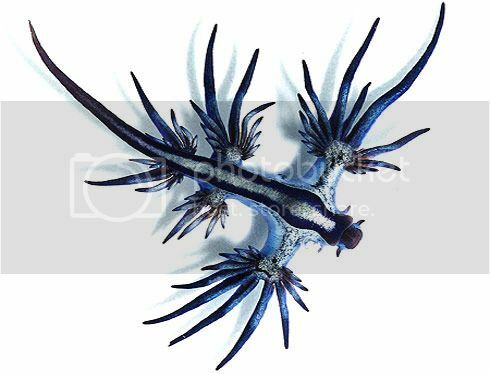 So I looked up Glaucus Atlanticus sea slug - and it's real. There is lots of info out there on this little slug, also known as sea swallow, blue glaucus, blue sea slug and blue ocean slug. Found off of South Africa, Mozambique or Australia, this little creature floats upside down riding the surface tension of the water. It feeds on Portuguese man o’ wars, consuming the toxic nematocyst cells that the man o’ war uses to immobilize fish. The slug is immune to the toxins and collects them in special sacs within the cerata—the finger-like branches at the end of its appendages—to deploy later on. So, while these creatures may be tiny and incredible-looking, they can pack a powerful sting! Look, but don't touch - and marvel at the amazing creatures in our world!